Beat the heat with a cool treat at one of these ice cream, gelato and snow cone stops! Love classic movies? The Paramount Theatre has been running the Summer Classic Film Series for more than 40 years. Visit their website for the full schedule of 100 beloved cinematic treasures that are gracing the theater&apos;s big screens throughout the summer. Now in its 14th season, the Austin Symphony Hartman Foundation Concerts in the Park are held in front of the Long Center on Sundays throughout the summer at 7:30 p.m. Concert styles include strings, woodwinds, big band and brass. This year, the Austin Chamber Music Festival celebrates its 20th annual event! The festival will take place over two weekends, presenting the best in chamber music performances, from classical to jazz, choral and more. Pack a picnic and come enjoy the free, annual musical at the Zilker Hillside Theatre. The outdoor amphitheater will host performances of "Shrek The Musical" Thursdays through Sundays beginning around 8:15 p.m.
Watch family-friendly flicks like "Raiders of the Lost Ark" and "Zootopia" on the grassy hillside or from an inner tube in the cool 72-degree water at Deep Eddy Pool with the Summer Splash Party Movie Series, kicking off at dusk. Pack a blanket and the family and make your way to Zilker Park for this summertime tradition. Held monthly from May to August, Austin&apos;s largest free concert series will welcome performances by local up-and-comers Hayes Carll and Carson McHone. Spend a warm summer night in the Hill Country, celebrating Texas wine, Texas BBQ and Texas music. Make your reservations now for this exclusive event which showcases all that Texas has to offer. Spend a day in San Marcos, floating the river and enjoying one of the most unique music festivals in Texas. Headliners include major acts such as Chromeo, Rick Ross and Bleachers as well as hot local acts like Night Drive and Riders Against the Storm. 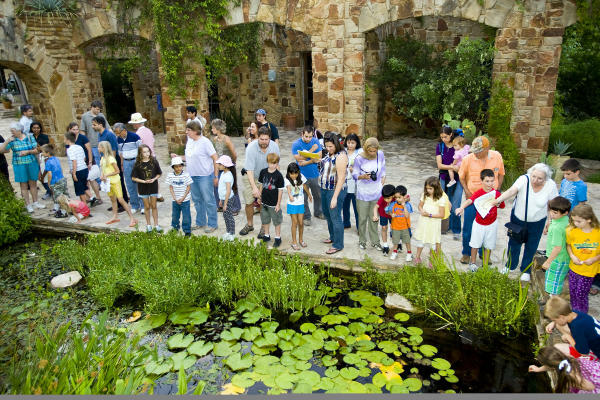 Courtesy of the Wildflower Center. 7/27/16 The Wine Down 3TEN – Austin City Limits Live’s annual series returns this year, with a brand new home at ACL Live’s brand new venue, 3TEN. This free event showcases the best of authentic Austin - local bands, bites, pop-up shops and… you guessed it, vino. Looking for more summer fun? Check out the Insider Blog&apos;s 20 Essentials for an Epic Summer in Austin or hit up one of our Top Swimming Holes and Splash Pads!